Four incredible days to explore the vast ‘Wilderness Zones’ of the Serengeti National Park. These reserves within a reserve have seen virtually no humans in the past 50 years. Whilst on the walk you will not see another soul apart from your guide and camp crew. Leaving the security of the game viewing tracks we head off-road into the wilderness walking areas. These areas have not been visited for nearly fifty years except by the occasional ranger patrol and they offer a view of the Serengeti as it was, un-marred by game viewing tracks and lodges. The drive in through the wilderness is two to three hours, depending on the game. We break the journey with a bush picnic then push on to camp. Once in camp we can go for a late afternoon orientation walk as the heat goes out of the sun. Here we are the intruders and we must learn to blend in if we are to get the full benefits of our visit. Overnight and full board in the African Environments Wilderness Camp. Two full days of walking, wandering amongst the towering rock kopjes that dot the landscape and unlocking the secrets of this magical area. Following the animal tracks discover the spring that never dries even at the hottest time of year, the small glades with the flush of sweet grass, the cave that the porcupine drags the old bones into. We will move slowly, resting under a cool overhang or the spreading branches of a fig tree. Walking safaris are not about covering distance; you will see less game on foot than you will from a vehicle but it’s about getting up close and personal to Africa, about using all your senses. It’s amazing how the distinctive smell of a buffalo can set your heart racing! 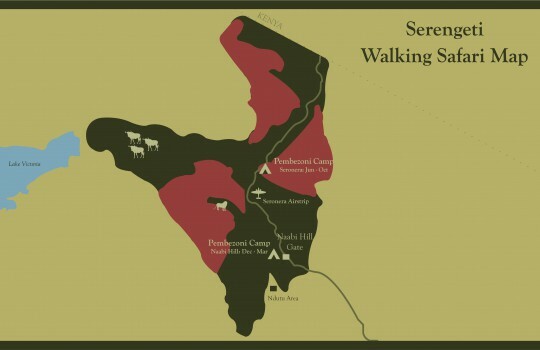 The whole camp will be packed up and moved each day to a new site so that the walk has a true feeling of being a journey – in Swahili a ’safari’ – moving across the wilderness. Up before dawn, a quick cup of coffee and a biscuit in the Mess tent then off out into the first rays of the sun to try and track down the last of the night’s action. This is the time the animals are relaxing their guard and can often be viewed before making their way into deeper cover as the sun rises higher. Later in the walk perhaps you will ‘stumble’ upon a sumptuous surprise Bush Breakfast. A short walk back to camp to pack and load up into the vehicles for our game drive out of the Wilderness Area, another fantastic game viewing opportunity in itself. This is the end of this four day walking itinerary however not necessarily the end of your adventure with African Environments. Vivid cultural experiences with the Hadzabe, this is not just a walking safari, this is hunting, foraging and interacting with one of Africa’s last remaining hunter-gatherer tribes. 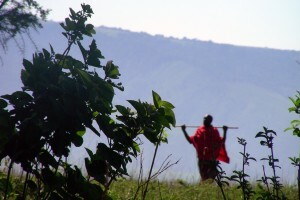 Walking with the Maasai – hiking through the hills and plains of Maasai country with your local guide.